While New Mexico is mainly known as a summer destination, it also shines—literally—at Christmastime. The rich cultural traditions of the Hispanic and Native American populations in New Mexico make Christmas an occasion for major festivals. A beautiful aspect of this celebration is the appearance everywhere of luminarias—small candles set in sand inside paper bags. Thousands of these small flames line streets, staircases, doorways, and even roofs. Visitors can enjoy luminaria displays in Old Town Albuquerque, historic Santa Fe, or in smaller culturally-rich towns such as Taos. In December in New Mexico, you are likely to find snow on the adobes and Indian dance ceremonies at the pueblos. A bonus is an opportunity to ski or snowboard. Santa Fe has a ski mountain just 30 minutes from the central plaza, and Taos offers awesome skiing just a short drive from town. In addition to skiing, many resorts offer sleigh rides, snowboarding, horseback riding, and tubing. It may be cold in the upper elevations but the lights and the Christmas cheer will warm your heart. At the Albuquerque Biological Park throughout December, this event features hundreds of thousands of twinkling lights, plus family activities, entertainment, food, crafts, dinner with Santa, and dinner with Father Time. This evening outing is fun for family and friends and truly impresses with hundreds of displays, all in keeping with the holidays and the theme of flora and fauna. Along more than 1.5 miles of the garden’s pathways, large and small displays work together in a stunning display of light and movement. You can see the River of Lights from Thanksgiving weekend through the end of December, except for Christmas Christmas Eve and Christmas Day. 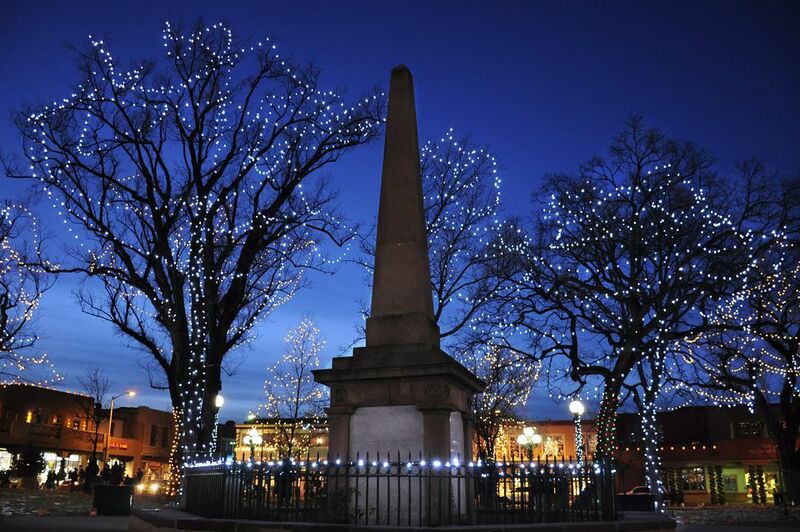 On Christmas Eve, the main plazas of Santa Fe and Old Town Albuquerque are decorated with thousands of luminarias. In Santa Fe, cider is served, carols are sung, and groups walk to the nearby Cross of the Martyrs. The annual Christmas Eve trek up gallery-filled Canyon Road in Santa Fe is lined with both luminarias and bonfires. Galleries are open and often serve snacks and drinks. The largest display in Albuquerque takes place on Christmas Eve in the Old Town Plaza and Country Club neighborhood, with luminarias lining the walkways by the hundreds throughout the plaza leading to the historic San Felipe de Neri Church and its Christmas Eve mass. In Santa Fe, families can also enjoy an annual Winter Spanish Market, a special Midnight Mass, and a traditional Las Posadas play about Mary and Joseph's search for a room in Bethlehem. An annual "Christmas at the Palace" event at the Palace of the Governors combines Hispanic, Anglo, and Native American traditions, and families will find carols, story-telling, Native dances, and an appearance by Santa Claus. On Christmas Eve, bonfires are lighted on Canyon Road and people bundle up to walk this adobe-lined road, stopping in for refreshments at the open galleries and restaurants. In Taos, a number of uniquely New Mexican celebrations happen throughout the holiday season. Expect to see candle-lit farolitos lining the snow-draped streets in front of old adobe shopfronts and homes. Yuletide is the entire holiday season and includes all the unique traditions of the holiday season in the mountains of Northern New Mexico. On Christmas Eve, head to Taos Pueblo for a stunning contrast between massive bonfires and the Procession of the Virgin with rifle salutes from the rooftops of the millennium-year-old adobe pueblo buildings. It's an inspiring pageant that's highly memorable. Then on Christmas Day, the same plaza is the venue for an ancient Native American ceremonial dance honoring winter. Note: no photos or video is allowed at this event. Madrid may be the ultimate New Mexican Christmas town. Back when it was a company-run, coal-mining village, its light display was so massive that airlines detoured flights to give passengers an aerial view from above. On Saturdays in December, stores stay open late, and you can take in the holiday lights while you do a little shopping. A number of pueblos are located near Santa Fe and Taos, and visitors have an opportunity to attend native dances during the holiday season. A number of traditional dances during the winter months honor animals; some pueblos also have torchlight processions of the Virgin on Christmas Eve, and dances on Christmas Day. One of New Mexico’s grandest holiday light shows takes place every Christmas season in Carlsbad. Boats glide on the Pecos River through a fairyland of twinkling lights created by more than 100 local homeowners who spend hours creatively decorating backyards and boat docks with millions of lights. Boat tours are 40 minutes long and sail every evening from the Pecos River Village.